Ten golden-colored camels adorned with sparkling ornaments line up for the finale of a beauty contest in one of the UAE’s northern emirates, awaiting the selection of two proud winners. 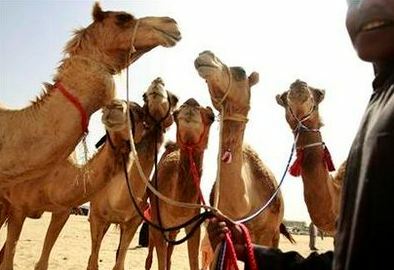 Gulf Arabs from across the region gather in a large sandy plot in Ajman to sit in for a four-hour competition, which will see the selection of the best out of 150 camels every day.The three-day spectacle should end with the top two finalists bagging luxury cars, while a remaining eight win cash. via Tribes show best camels at beauty pageant – Yahoo! News.